“She’s like my older sister,” said eight grader Sarah, referring to McKinley Beacon’s Youth Program Assistant Director. The Assistant Director also happens to be a Sarah—Sarah Lanza. 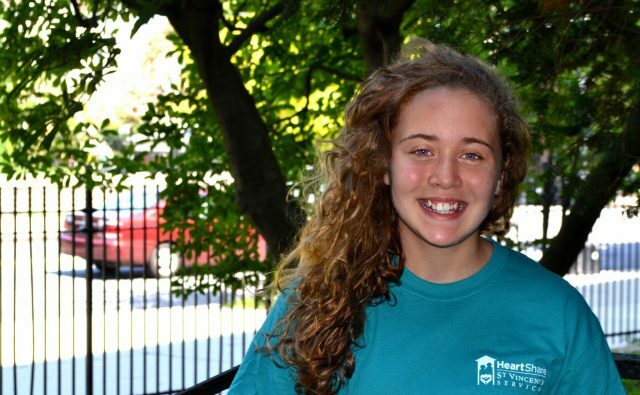 The younger of the pair has been attending HeartShare St. Vincent’s Services after-school and summer camp programs year-round since she was in the third grade, making her one of the longest-standing participants currently at the program. Assistant Director Lanza has been a constant in her life for quite some time. An ongoing exchange of encouragement and advice has brought them a long way – a bond of sisterhood that’s kept younger Sarah confident and engaged. “I remember when I participated in the rally to save our program,” Sarah described, recalling her first year in the program. “Sarah remains humble in everything she does, even though she’s won ‘Star Dancer’ multiple times,” shared one of the dance coaches at the program. HeartShare St. Vincent’s Services’ Beacon and Cornerstone Programs, which include after-school and summer camp opportunities, provide critical support for struggling families. Joseph Impeduglia, Beacon Director for almost 20 years, has nurtured hundreds of students who rely on the stability of the program’s nutritious meals, academic guidance, as well as fun and safe activities. “There are some students who would not be eating, who would not be safe if we did not have them here. The term Beacon is generalized as a lighthouse with a safety light. That’s what this program is for the community,” Impeduglia added.